In the remote past when people had to struggle for survival against the merciless forces of nature, they also realized a fact that the radiant sunshine dictated all facets of living in the universe. The movement of the sun brought in the alternation of day and night, changes of seasons, blossoming and withering of plants, and the very existence and sustenance of us humans. That ever-refreshing vital force of the universe, which kept all life forms going and thriving, was called yuanqi or jingqi (sap, energy). Primitive men believed that in everything, i.e. heaven, earth, sun, moon, mountains, rivers, plants, trees, etc., and in every phenomenon, such as wind, rain, thunder, lightning and so on, there existed an animating force, a deistic spirit. 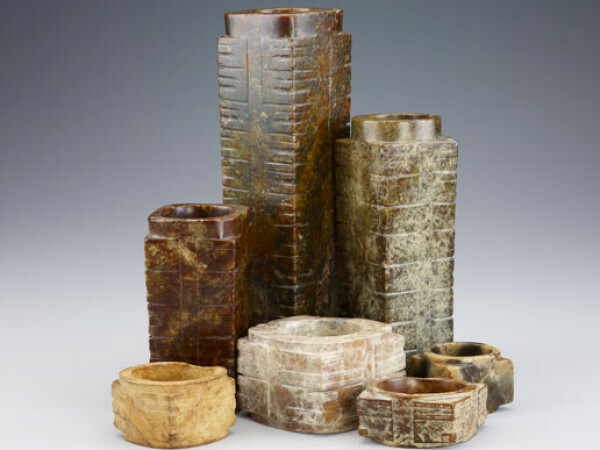 As the early forebears picked up bamboo, wood, stones, and bones, turning them into tools, they found that a few stones were not only hard and enduring, but also beautiful and smooth. Amazing tools made of this fine material helped them as if by magic, while its radiating sheen looked just like the springtime sunshine which woke the world back to life. They figured that the beautiful stone was also imbued with the life-catalyzing jingqi and gave it an elegant name yu, i.e. jade. They further believed that with its jingqi which was already enabling humans to commune with deities, the beautiful jade could acquire an even higher power of affinity if fashioned after the way the universe orbited, or into the images of the clan ancestors. Time passed; from the middle to late Neolithic period (c. 6000 to 2000 B.C. ), scattering villages gathered as alliances and gradually developed into states. Society stratified and classes formed; a group of wise shamans capable of channeling with deities emerged to govern the affairs of all, led by a chief shaman. Through the beautiful divining jade they received wisdom from spirits, engaging dialogues with heaven and earth. 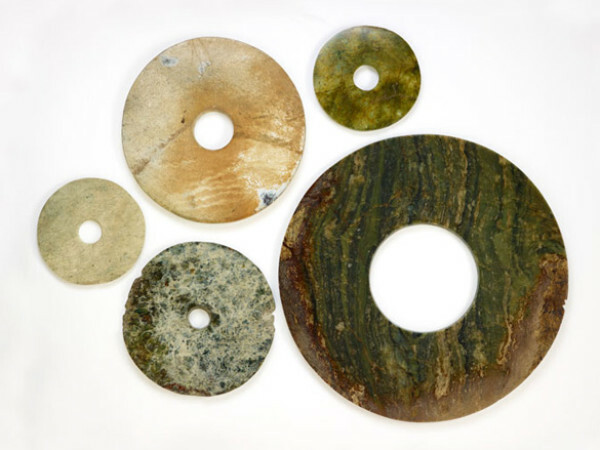 The earliest examples of jade from the lower Yangtze River region appear in the latter phases of the Majiabang culture (c. 5100–3900 BC) and continue into the 4th–3rd millennia BC in the Songze and Qingliangang cultures of that region. 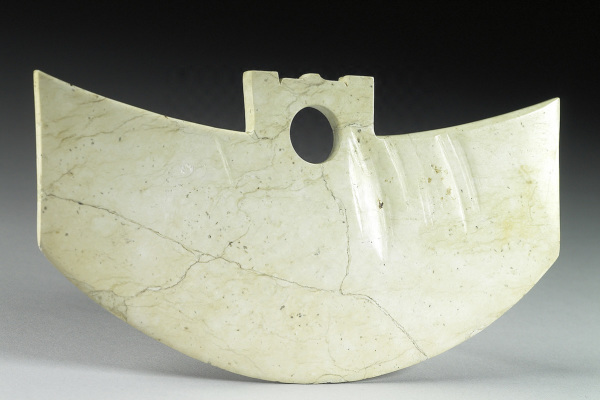 Remarkably sophisticated jade pieces appear after 2500 BC in the Liangzhu culture of southern Jiangsu and northern Zhejiang provinces (c. 3400–2200 BC), many with an apparent lack of wear and practical usage that suggests a primarily ceremonial function. These include the first examples of the flat, perforated bi disk (with a hole in the center), which became the symbol of heaven in later times, and of the cong, a tube with a square exterior and a cylindrical hollow interior. The cong was used to represent the cosmos by conjunction of yin (square, earth, female) and yang (circular, heaven, male). It was also possibly associated with astronomical sighting or geomantic site selection. These two items remained part of the Chinese imperial paraphernalia until the early 20th century. Also present at this time, in the Liangzhu culture and, in Shandong province, the Longshan culture, are ceremonial gui and zhang blades and axes, as well as an increasing variety of ornamental arc-shaped and circular jade pendants, necklaces, and bracelets (often in animal form), together with the significant appearance of mask decoration; all these forms link the Neolithic jades to those of the subsequent Shang period.